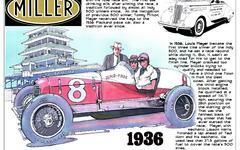 The early Indianapolis 500s had an epic quality simply because they took all day to run: like six hours. Back in that day, Indianapolis had both morning and evening newspapers, and the evening Indianapolis News would go to press before the race was over. In May 1911 they reported on the progress of the race at 300 miles, leaving the finish to the next morning's Indianapolis Star. This clip is what so many Indianapolis residents saw about 4 p.m. at news stands. Keep in mind too that there was no television, not even radio, so if you were not at the track, the papers or word of mouth (or the telephone for a lucky few) were the quickest sources you had to find out what was going on. Note: While this is a great clip, it is also not in the best of shape. I have presented it in two chunks. There are two articles, but due to the poor reproduction it is not readily apparent. Have patience, there is good information.